A breed of British origin and the first known retriever, the Curly-Coated Retriever is depicted in sporting prints dating back 300 years. He was the first breed to be trained to retrieve game, especially waterfowl, and carry it carefully to the huntsman's hand. From all reports, he was so good at his job, the Curly-Coat became the gamekeeper's favourite. However, because he was a "finished" breed long before stud books and breeding records were maintained, his ancestry must rely on a series of educated guesses. His general conformation and typically curled coat provide clues. 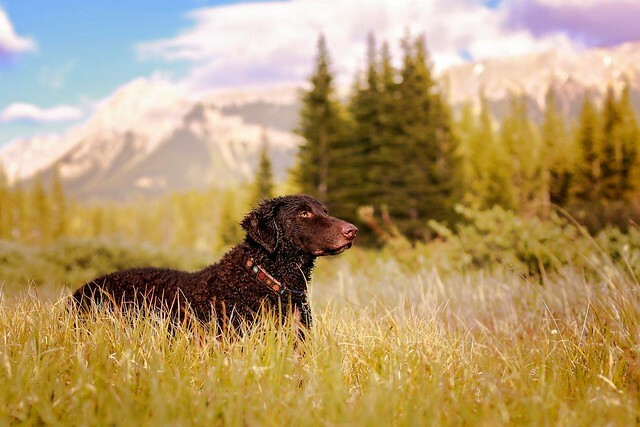 It is assumed that the St.John's Newfoundland (a breed similar to the modern Labrador Retriever), the English Water Spaniel, The Poodle, and possibly various types of setters combined to produce the Curly-Coat. Some claim that the Irish Water Spaniel was used, submitting that the proof is to be found in coat colour, which in the Curly-Coat may be either black or liver, the latter being the only acceptable colour in the Irish Water Spaniel. Those who disagree, point to the fact that the Curly-Coat has not, and never has had, the spaniel's curly topknot. The Curly-Coat was first shown in England in 1860. In 1896 a Specialty club was organized to promote the interests of the breed. In this, they were successful until about the year 1914, when the popularity of both the Labrador and Golden Retrievers superseded that of the Curly-Coat. While the breed has never been able to recaputre great public interest, it does have a faithful, but limited, following around the world. It is said that today, more Curly-Coats are registered in New Zealand and Australia than there are in Britain. Large breed entries are usually to be found at their more important championship shows and the breed is widely used for quail hunting. The Curly-Coat's "down under" supporters claim that the breed works as well on upland game as it does with waterfowl. 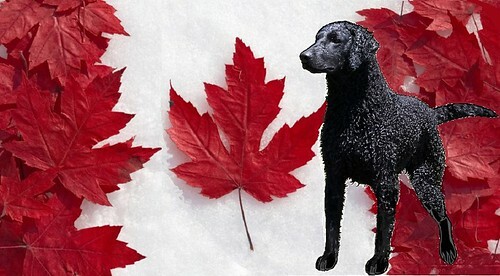 The Canadian Kennel Club Stud Book shows that Curly-Coated Retrievers were registered in Canada for the first time in the years 1912-1913. GENERAL APPEARANCE: A strong, smart, upstanding dog showing activity, endurance and intelligence. COAT & COLOUR: Coat should be one mass of crisp curls all over - a slightly more open coat not to be severely penalized. A prominent white patch on breast is undesirable, but a few white hairs allowed in an otherwise good dog. Colour: black or liver. HEAD: Long and well proportioned, skull not too flat, jaws long and strong but not inclinded to snippiness, nose black in the black-coated variety, with wide nostrils. Teeth strong and level. Eyes black or brown, but not yellow, rather large but not too prominent. Ears rather small, set low, lying close to the head, and covered with short curls. FOREQUARTERS: Shoulders should be very deep, muscular, and obliquely placed. Legs should be of moderate length, forelegs straight and well set under the body. BODY: Chest not too wide, but decidedly deep. Body rather short, muscular, and well ribbed up. Loin powerful, deep, and firm to grasp. TAIL: Should be moderately short, carried fairly straight and covered with curls, slightly tapering toward the point. FAULTS: A saddle back or patch of uncurled hair behind the shoulders should be penalized.